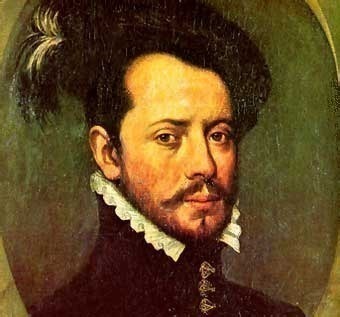 Hernando Cortes or Hernán Cortés (1485 – December 2, 1547) was a Spanish conquistador who led an expedition that caused the fall of the Aztec empire and brought large portions of mainland Mexico under the King of Castile, in the early 16th century. Cortés was part of the generation of Spanish colonizers that began the first phase of the Spanish colonization of the Americas. Born in Medellín (Spain), to a family of lesser nobility, Cortés chose to pursue a livelihood in the New World. At the age of 14, Cortés was sent to study at the University of Salamanca in west-central Spain. This was Spain’s great center of learning, and while accounts vary as to the nature of Cortés’ studies, his later writings and actions suggests he studied Law and probably Latin. After two years, Cortés, tired of schooling, returned home to Medellín, much to the irritation of his parents, who had hoped to see him equipped for a profitable legal career. However, those two years at Salamanca, plus his long period of training and experience as a notary, first in Seville and later in Hispaniola, would give him a close acquaintance with the legal codes of Castile that helped him to justify his unauthorized conquest of Mexico. He went later to Cuba, to aid in expeditions where he received an encomienda and, for a short time, became alcalde (magistrate) of the second Spanish town founded on the island. In 1519, he was elected captain of the third expedition to the mainland, an expedition which he partly funded. His enmity with the governor of Cuba, Diego Velázquez de Cuéllar, resulted in the recall of the expedition at the last moment, an order which Cortés ignored. Arriving on the continent, Cortés executed a successful strategy of allying with some indigenous peoples against others. He also used a native woman, Doña Marina, as interpreter; she would later bear a son for Cortés. When the Governor of Cuba sent emissaries to arrest Cortés, he fought them and won, using the extra troops as reinforcements. Cortés wrote letters directly to the king asking to be acknowledged for his successes instead of punished for mutiny. After he overthrew the Aztec empire, Cortés was awarded the title of Marqués del Valle de Oaxaca, while the more prestigious title of Viceroy was given to a high-ranking nobleman, Antonio de Mendoza. Cortés returned to Spain in 1541 where he died peacefully but embittered. Due to the controversial undertakings of Cortés and the scarcity of reliable sources of information about him, it has become difficult to assert anything definitive about his personality and motivations. Early lionizing of the conquistadors did not encourage deep examination of Cortés. Later reconsideration of the conquistadors’ character in the context of modern anti-colonial sentiment and greatly expanded concern for human rights, as typified by the Black Legend, also did little to expand understanding of Cortés as an individual. Next Story → Paranoia in Hollywood: Who’s Afraid Of The Dark?